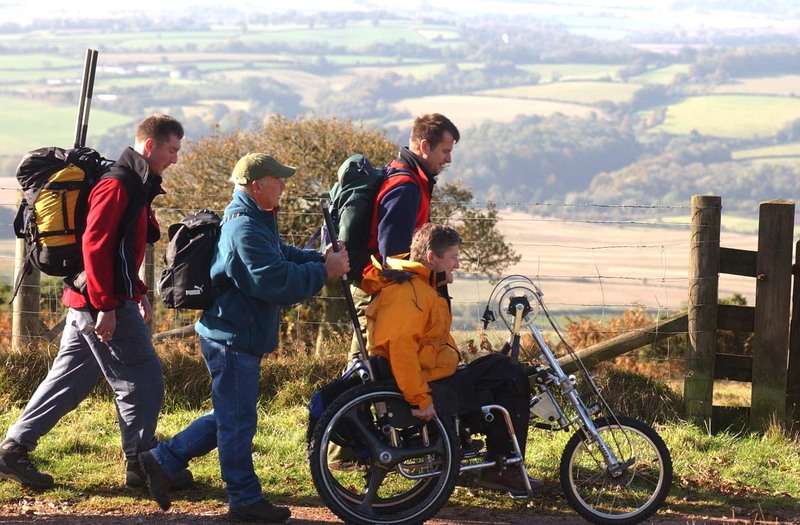 A totally new wheelchair has been built for this new attempt by Phil Casso (PCASSO) and his workforce at Chevron Wheelchairs and several tests have already been carried out, one on the Quantock Hills in Somerset on the 26th October, with just a percentage of the new 10-man support team available and the other on Mt. Snowdon on the 9th of November, with all but three of the whole support team available. The chair was tried and tested on various muddy bridle tracks, heath land and various other terrains on the Quantocks and performed fairly well on the 1500ft climb giving the Royal Marines support crew a chance to see how the chair performed and, to some degree, the limitations of my own balance in this new chair – I only tipped over once on this occasion! Susan Lilico, Charlie and Bo who are the selected crew for her ‘Arena’ production company, accompanied us to shoot some film footage. The Western Daily press national / local newspaper was there to take photo’s and to generally help us promote the forthcoming challenge. With many lessons learnt, we returned home and had all identified problems with the chair immediately addressed so as to get the chair ready for the next trial on Snowdon just two weeks later where the terrain was obviously different and consisted of a lot of rough track land and then rocky scree – all-in-all a good test for everything and everyone. Again accompanied by the film crew, Susan, Charlie and Bo, we made the summit in around three and a half hours. We were greeted at the summit by an uplifting round of applause from fellow hill walkers, who were then asked to empty their pockets – Highway robbery! I think they called it years ago!! On both of the trial occasions the weather had stayed fairly good given all of the rain and storms that were going on during that period - Maybe an Omen? De je vu was happening - as in 1998 there was an impending middle east crisis, which had the chance of putting a damper on the event and certainly cost us the opportunity of having a film crew from accompanying us. After all the initial work that had been done, Susan, Charlie and Bo had to withdraw. We were also to lose a member of the team. Derek had to withdraw from the event due to various reasons beyond his control, leaving him 'gutted' especially giving that he had been part of project 98. 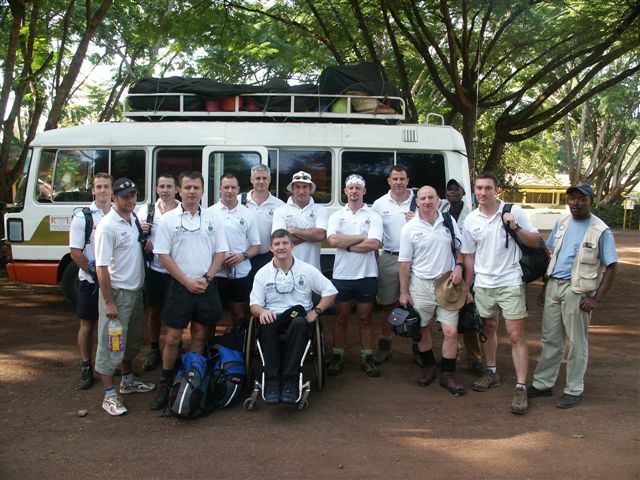 "The Team Arrive in Kili"
The support team set out a week earlier than Jon, on the 8th Feb to fly with Ethiopian Airlines from Heathrow. They arrived in good time, given the recent political climate, along with the majority of kit. Then the real challenge began. The flight to Kili was via Rome, Addis Ababa and Nairobi, which was quite simple in itself, however the aircraft developed technical difficulties, which resulted in a 15 hour delay in Addis Ababa, meaning arriving in Kili at 5 a.m a day late! There was a Silver Lining to the end of this horrendous journey in the form of far better accommodation than they had originally anticipated. This was because unlike the first time that Jon and the team did the original event in 98 and lived in tents and sorted their own food etc, they had been allocated an excellent accommodation facility, including school dinners, at 'The International School Moshi' along with an outstanding hospitality provided by Keiron White and his staff, in particular Gill and Reg and their two little "Angels!" Fern and Looby, whom had inherited them as their neighbours. Jon and the remaining member of the team, Mark flew out on Valentines Day (Both have very understanding partners). Their journey was also to be marred. 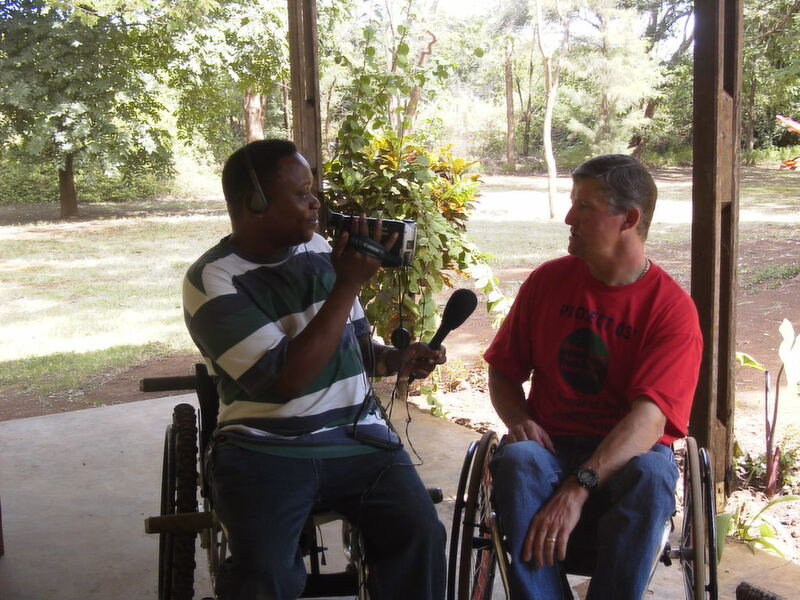 Given all the correspondence between Jon and Ethiopian Airlines about the event, when arriving at Heathrow Jon was asked if he was sure that he couldn't walk. This was then to lead into being told that there was no aisle chair available for the aircraft, once again Jon was asked if he could walk. Not to let things get in the way Mark and Jon just told them to book them on the aircraft and they would improvise. 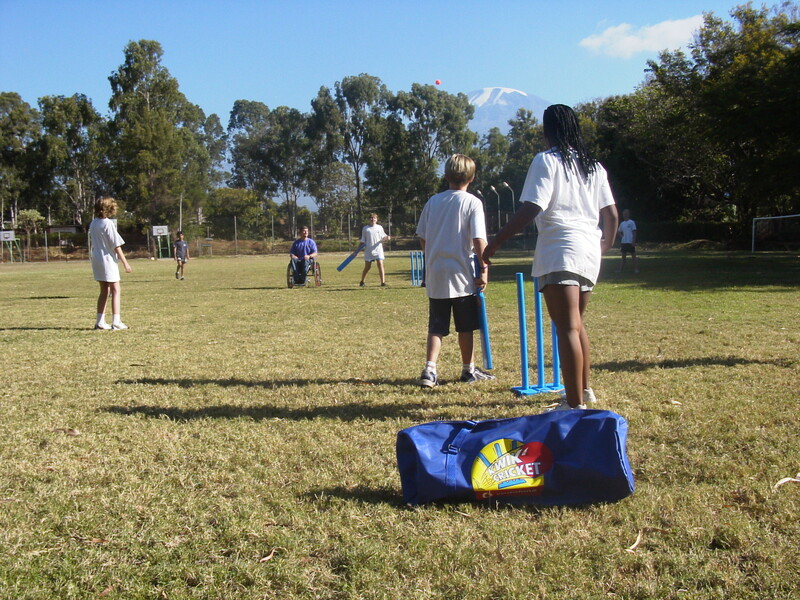 This theme continued all the way to Kili. 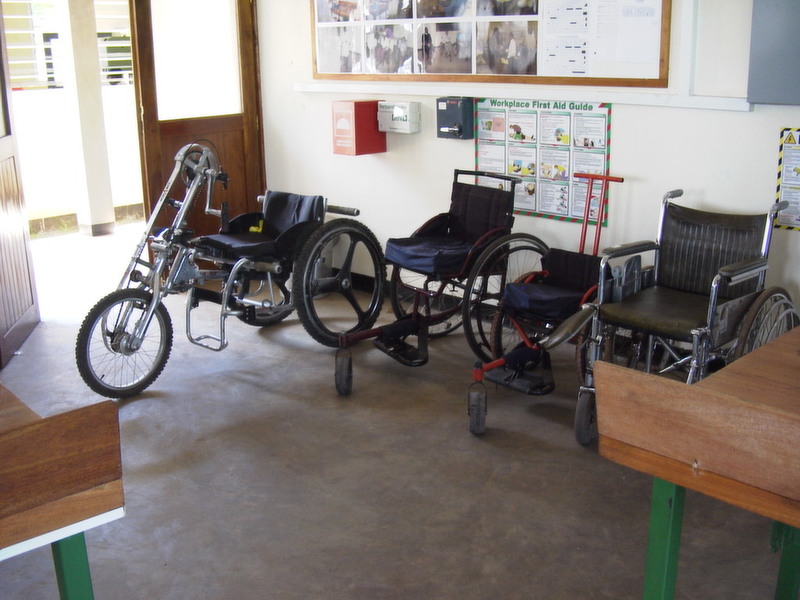 They finally arrived in Kili very much on time to be greeted by an African thunder storm and the fact that some of the kit had been damaged in transit the previous week, including the Mountain Chair (this is since been adequately adjusted by DIY Rik) Maybe an Omen! The one thing that had not changed since 1998 was the noise every night from the wild dogs, crickets and cockerel's, but now with additional harmony from wild Boar, leaving very little time for sleep; not very good preparation as we are due on the mountain within 36 hours of arriving. The good news is, despite the rain that mountain looks good and the snowline is considerably higher than in 1998. The Team are now all getting prepared for the challenge ahead and today carried out logistics and final packing of kit. Jon, Mark and Robbie also met with Jo to have final discussions and ensure that everything was in place for an early start tomorrow (17th Feb) ' Day one. The Team send their best wishes to all their family and friends and hope to make contact from the summit next week..... The next update will be upon arrival back at base... Watch this space' For the media the Satellite phone (number on home page) will be going on the mountain with the team (No replications of 1998) and work load allowing should be 'live' between 20:30hrs and 21:00hrs local time due to conservation of battery power for the summit (+3 hrs GMT). Having tried and tested the satellite telephone at home and having had no problem, I felt no need to try it out until yesterday. 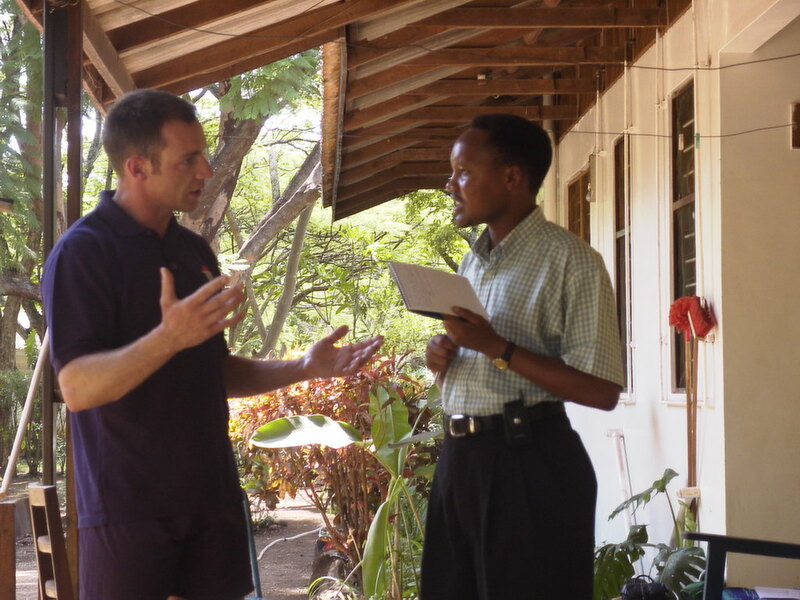 Mark Harling and I tried it out and found that whilst we could easily establish a link with the Indian Ocean Region Satellite, as previously used out here, we were continually getting an invalid service message being displayed on the handset. Despite being the weekend, as Murphy's Law goes, I eventually managed to get in contact with my wife Lynn, to see if she would be able to secure any reason for the invalidity signal from Applied Satellite Technology, as they are always spot on, but directly on hand for immediate support if and when blips like these happen. I thought that it was best to still chance the phone on the mountain and fully charge it up, just in case Lynn managed to get matters sorted out. Following a final briefing yesterday afternoon between Robbie Roberts, myself and our on site logistical consultant, Jo Anderson, the transport had arrived on time, bright and early. The team assembled, ready to go and eager to get on with the task ahead. Those of us that had been involved in the original attempt in 1998 were hoping that the weather was going to hold as it had done since the day that Mark and I had arrived and not change for the worse as it did back then. The morning was a bright and warm one and the journey towards the gate of the mountain was good, spirits were generally high. As we got closer towards the gate of the mountain a weather front was seemingly appearing - was this to be another turn of events- Neil and Steve must have thought so as they went straight to the shop at the gate to purchase umbrellas. Thankfully nothing much happened at all and with Jo to hand we had a slightly less bureaucratic transition onto the mountain than we did in 1998 and finally we were on our way through Manrangu Gate at 11:02 a.m. Whilst Jo stayed behind to see how many porters we would be forced to have for the size of the team and the amount of extra equipment. He had intimated that an additional four would be needed, but would take less if possible as this would have an impact on our overall limited finances. The contrast to the start of the attempt in 1998 could not have been more diverse. The sky was blue and the sun was shinning bright and strong. We had been led to believe by many people that the trail to Kibo had been vastly upgraded and it was soon very apparent that the bottom track had definitely been much improved over the last five years. This, coupled with the fact that the trail was dry and having the fit strong supporting team of Royal Marines to hand meant that we were covering the trail in about average trekking time- unlike the 50-75%additional time required in 1998. This total contrast continued at the half way point, when sitting down for lunch- yes sitting down to lunch. A picnic table was laid with bread, cheese, fruit and plantain chips, time was definitely on our side and on many occasions we were even told to go more 'Poly-poly'- slowly -slowly, otherwise , Mark suggested, taking more rest periods if we were going to keep moving at this quicker pace. 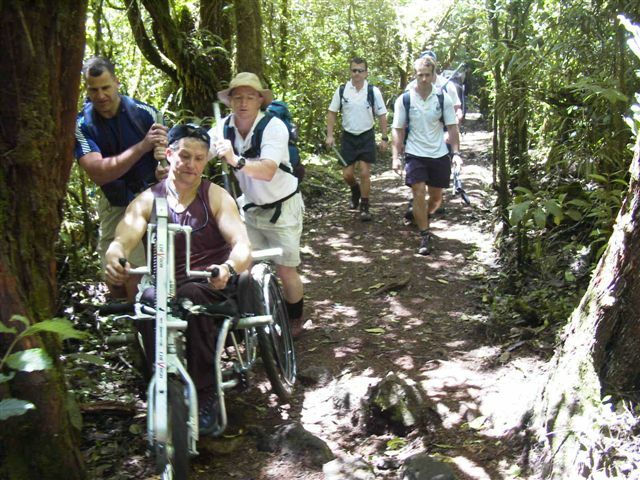 Jim Mann further commented that we were taking some of the obstacles much too hard and should slow down at the approach to any obstacles and carry-out a lifting procedure, rather than do unnecessary damage to the wheelchair, with so far still to go. Almost immediately, after having lunch, we had to face quite a steep climb and a much rougher terrain, calling for the need for the titanium lifting poles to come out, especially when we came across a fallen tree on the trail, which called for an almost shoulder height lift. Stopping to take on more water from our personal Camelbak systems, we just happened to stop under a branch that had a troop of fire ants in and they were dropping down on some us and having their own picnic lunch. The terrain stayed pretty much the same from that point onwards to Mandara, but the improvements in the first part of the trail, along with the much needed intermittent shade from the heat of the day were really appreciated, as it allowed us to continue making good ground and arrive at Mandara hut only one and a half hours outside normal trekking time at around 15.35p.m. and allowed us to make the most of the time gained for extra recuperation and to hopefully be fresh for the anticipated gruelling day ahead. As I had previously requested of Jo by e-mail, we were allocated new and much smaller four people huts this time, they were new, reasonable and certainly much better than the old decrepit white building usually given out to larger groups such as ours. The only problem was that it appeared that the previous tenants had left the solar powered lights on and had used up all the stored energy, meaning we had no lights and were dependent upon the streamlight head torches, which served their purpose excellently. We had established from Siegfried that in the end, an additional eleven porters had been assigned to us, which caused great financial concerns. Contact with Jo had to be made quickly as there was no way that we were going to be able to afford that size of additional financial burden. At this point we tried to get a service out on the satellite telephone and again it stated invalid service- this was becoming an issue as every time we tried the phone it was using up the valuable battery charge. Lynn had managed to get a text through to us stating the name of the service contract supplier that we needed to make contact with- we would have to wait for a mobile or satellite signal to become available. Waking at 5.30 a.m.in anticipation of being greeted at 6a.m. by hot water for a wash, a cup of tea and breakfast is definitely the 'best way' to start the day ,especially as the local resident monkeys had been very vocal all night-it was hard to believe that we were on our way up a mountain. Unfortunately African time had happened again and we had to wait until 6.30 a.m. for the anticipated 'luxury' and that set back our starting time from 8.a.m until 8:30a.m. Whilst resting in the hut last night I had noticed that there was a slight buckle in the footplate of the chair. Jim Mann's advice the previous afternoon had obviously been totally founded and more care had to be taken at any obstacles in our path and actually make our ascent more efficient. 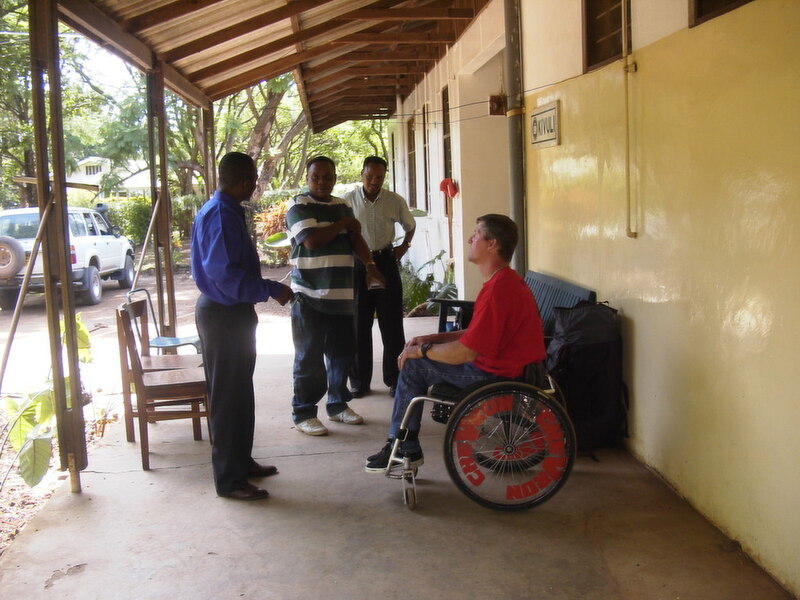 Steve Hargreaves had also suggested that the spare wheels should now stay with us, as opposed to going on separately with the porters, which was later going to prove to be sound advice. Despite the trail on the first day being much improved, complacency was not the order of the day and many thoughts of the original teams' debilitation after the fourteen gruelling hours that it took in 1998 was still fresh in my, Mark's, and Robbie's minds, as were all members of that original team, but this was eased somewhat, given the strength and character of the team around us. The trail started out quite abruptly but it was not to difficult and again it seemed only to take twenty minutes or so for the team to get into a good stride pattern. Again the start of the trail had been much improved, but this was not where we were anticipating the difficulties -it would be further up the trail when we would be greeted by the many ravines created by the grand Mawenzi Peak. The trail was very much like path in places, only being marred, from the wheelchair perspective, by the many drainage ditches along it's way, at times stopping the rhythm of the pace. A pleasurable and , at times, much needed cooling breeze had picked up from the east and we could actually see the 'company snake' as Simon and some of the other team members called the many fellow trekkers on the trail ahead of us, which was most unlike 1998 when we saw no-one for many hours. At 10:30a.m. we had a full pit stop, as opposed to the more frequent drink stops that we had now been taking, to take on board essential carbohydrate, salt and minerals in the form of bananas and salted popcorn. Whilst taking this stop Mark and I struck up the satellite phone for one last chance at getting a reception. We were so high up and open to the North east, that I thought I would try to make a link with the Atlantic Ocean Region East Satellite (AORE) -Success! I immediately telephoned Lynn at 7:35 GMT, forgetting that she would already transporting our daughter to University, to let her know that the media could now contact us and the company service provider to say the same- they advised us to continue using the same link as far as possible. The good thing was that our son Robert took the message, but the main problem was now that we had used so much battery trying to secure a link, that it was going to be pure luck if we would have any battery time left even if we did get another opportunity to link with the AORE satellite. It had come to light that the phone might have inadvertently switched on inside Mark's rucksack, as it was difficult to believe that the battery would drain so quickly otherwise. We continued on the trail to Horombo, making steady progress-that was until 'blow-out'- the tyre had gone flat, possibly due to crudely made bridges across some of the drainage gullies and lower ravines having nails sticking out of them all over the place. We had spare wheels, so that wouldn't be too much of a problem-wrong! The spare spindles that had been tested out previously were just not holding, so it resulted in taking a tube from one of the spare wheels. That evening 'fix -it Rik' came up with a solution. 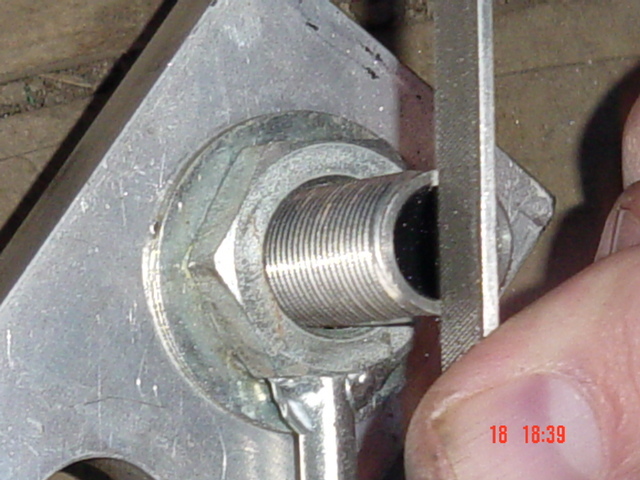 He filed a slot in the spindle receiver-job done! 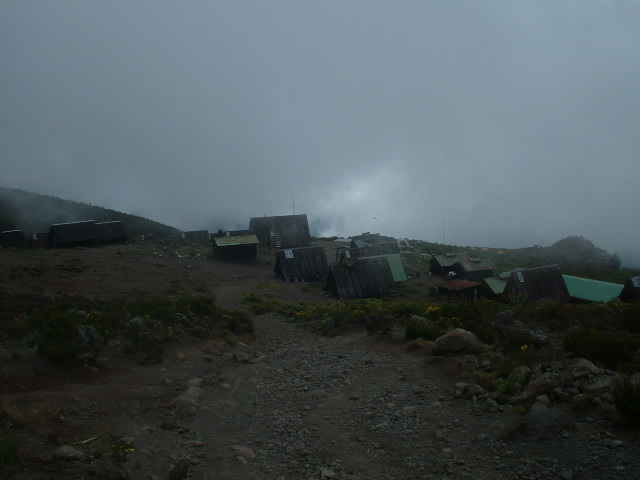 We arrived at Horombo at 2:30 p.m, again just outside normal trekking time. Later that afternoon a lot of discussions took place about the best way to proceed the following day for the team , my self and acclimatisation. It was presented to me that it would be best that the whole team go to Kibo, leave me and two other team members there and then return to Horombo to acclimatise. The two members of the team would get up the following morning and scout the Kibo to summit section and evaluate the trail and I would just stay there and get used to altitude. This was contrary to the advice that Jo had given some of us and given that he had so much more experience on Kilimanjaro, it was further discussed and decided that the two members would still go and stay at Kibo and on the following day, evaluate the trail to the summit, and the rest of us would ascend to the saddle and then return to Horombo, as suggested by both Jo and Siegfried - the chief guide- and then continue to Kibo the following day. 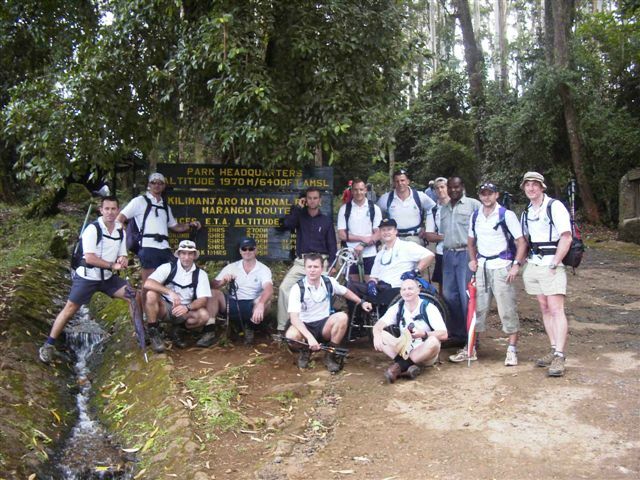 Given the fact that for a long time after the 1998 attempt we had been told on many occasions, by many more knowledgeable people than ourselves, that one of the reasons that the previous team were so debilitated at the top end of Kilimanjaro, apart from the sheer workload and time restriction, was that we should have had an extra day for acclimatisation, if we could have afforded it, both time wise and financially. Everyone will have their own opinions on such matters, but there appears to be a general consensus, including some within the support team itself, that the best way to acclimatise is not to just stay at a given point, resting and doing nothing at all, but to do some work at, or up to, a particular height and then return to a lower place of rest for maximum gain. It was with that very advice in mind that I had looked for a compromise with the support team on day two on how best to utilise to use day three for optimum advantage for everyone, including myself - after all I had gotten to over 16000ft previously, which was as much as most on the team had done. Hopefully, with the compromise now made, I would also be able to fully benefit from the extra acclimatisation. The new huts that we stayed in at Horombo were, once again, more than adequate given the circumstances. Now sleeping six, as opposed to the 'fours' we had at Mandara, we were now joined by Paul Weir or 'Lats' as he was called and Jimmy Mann. The views from Horombo, when the cloud is not in, are spectacular. With the peak season in full swing the huts at Horombo were all full and there were even more additional climbers to this who were camping, meaning that our porters had our food ready a hour or so before we could actually get into the communal dining hall to eat and even then it was still full, leaving no room for the wheelchair. Given this I decided that it was less inconvenience to everyone to have any food now brought to me and dine alone in the hut. There had been a noticeable difference in the temperature overnight due to the weather front that had come in during the late part of the previous evening and, despite the very good Snugpak sleeping bag that I had, it took a while for my legs to warm up overnight, taking until 03:25am, highlighting the additional difficulties that lack of normal circulation causes. I woke at around 6.6:15 a.m after a somewhat broken nights sleep, listening once again to the varied noises of local wildlife and had breakfast of bananas and toast brought along to the hut. I had actually woken to receive a text sent the previous evening (we were still trying to be ultra cautious with any battery time that we had left between us and limited the time that phones were switched on) from my wife stating that Radio Bristol had wanted to make contact for a live interview at 13:10hrs. This would work out quite well, given the limited distance that we had chosen to do that day and, all things going our way, we would be back to Horombo well in time. We set out around about l0 a.m as planned. 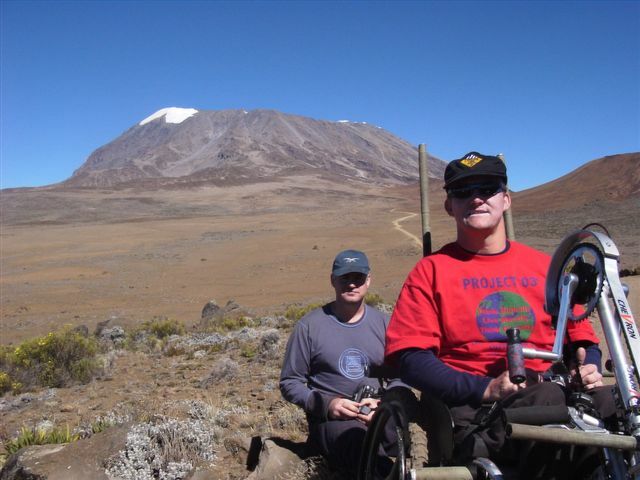 Neil and Simon had left slightly earlier to make their trek to Kibo and then scout the summit. This meant we would be down on team size and more changeovers and rest periods would be necessary. We set out at quite some pace; it was very noticeable that the diamox tablets had a certain effect on some of the team members. 'Poly Poly' was called for as it was noted that we were ascending at a quicker rate than climbers would normally go and certainly much faster than necessary. Today would not only allow for acclimatisation but for also trying out the best techniques for the day ahead in order to be most time and effort efficient. The start of the climb started out exactly as I had remembered during the previous attempt, a hard steep climb. Despite the reduction in numbers, but very much as expected, the team worked well together to reduce any apparent negative effect to very negligible indeed, in fact in some strange way there was even more focussed teamwork; Whilst I had initially not taken too much notice of the banter started by one of the members who should have known better, given his seniority, over the past couple of days, by calling his group the 'A' team, even if it was initially for fun, it was apparent that there was more than just a little banter that was developing in the team and it was something that shouldn't be allowed to get out of hand, especially on a mountain where total team unity was absolutely essential. We reached the 4,300 metres mark, so it was decided that would be enough for the day rather than go for over exertion. We rested for about half an hour to try to gain maximum benefit and then returned back down to Horombo. It wasn't to be a minute too soon as clouds were coming in along with another Kilimanjaro generated weather front. The ride back down was also to test out the stability of the chair and what we would do best for additional downhill braking. For the braking two men hooked up to the back of the chair with ropes and this worked very effectively, although the chair was more unstable than the original due to the fact that we had reduced the wheelbase and overall width to make it more compact, given the terrain we thought we had to cover. 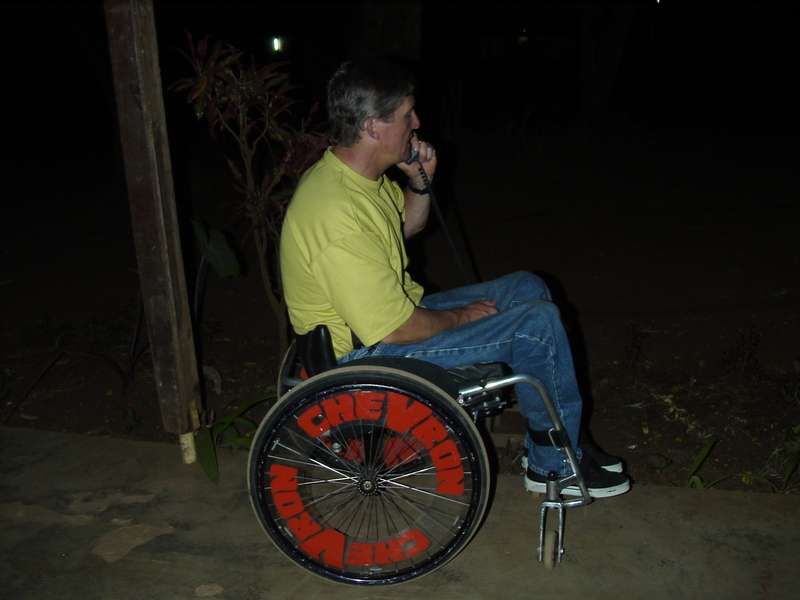 As soon as we got back to Horombo, Jim set his alarm to ensure that we were well on time for the telephone link with Radio Bristol. He switched on his phone and we waited for an half an hour or so, to no avail. He then sent another text to my wife to see whether it could be established if it was still viable. Not knowing where or when Lynn might text back, he had to switch off the phone to conserve the battery. A later text confirmed that there was a communication link up 'blip' from both sides. We would just have to wait and see what we could do from here on, but we knew that GSM coverage from herein was very unlikely. The weather front had turned the day very chilly, but towards the evening it warmed back up to a damp 6ºC, which brought the midges out in force. There was some 16 hours plus now for the team to adequately rest and recuperate now before starting off again tomorrow and although most of the team slept in the afternoon, they were still back in bed by 19:30hrs. The repair that 'Rik' had done to the chair was also tested out and seemed to be fine. We were still hoping for some communication from Jo Anderson to clear up the outstanding query about the additional cost that might be incurred for the extra 11 porters. Tomorrow - Kibo, and thereafter the real work begins! Day Four - The trek to Kibo. The trek to Kibo is almost like a strolling rest day for most climbers on Kilimanjaro, gaining just short of another thousand metres of altitude, but in a nice steady ' plod'. Well that was the way I heard it described anyhow. I am sure a lot of the fellow climbers who use that route would have their own personal interpretations for the Horombo to Kibo section, especially those that we saw being taken off of the mountain by special stretcher yesterday. Very much out, and on the way down by stretcher! All mountains should be respected, not underestimated - all can take their toll. We left the camp at Horombo at a seemingly leisurely and luxurious 8.15 am. We weren't too far into the short sharp fairly rocky climbing section out of Horombo, before I realised that the chair was definitely handling different and feeling more difficult than during our trial run on the same section yesterday. 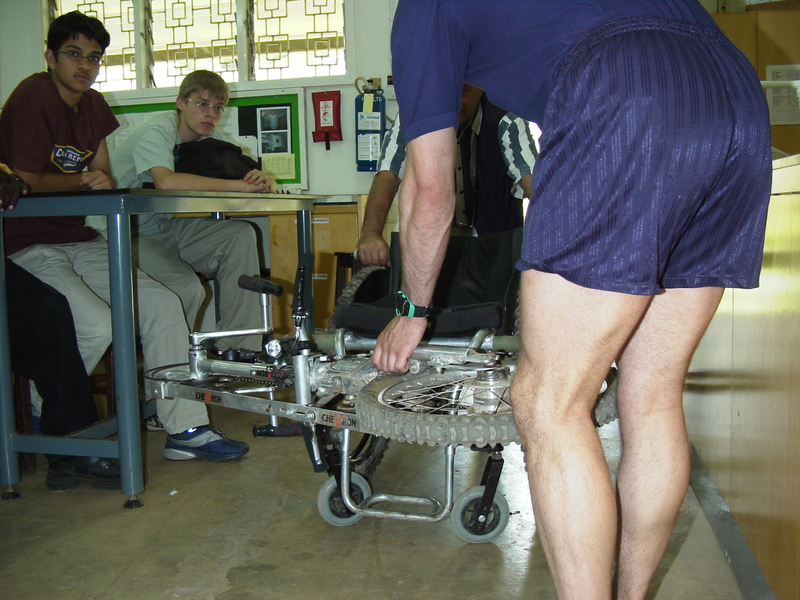 It soon became apparent that the problem had been that the rear wheels had been left in the wrong hub setting after the tests were carried out to check on the repair to the chair the previous evening, and had threw the centre of balance, and then subsequently the traction generated on the front wheel out. Soon corrected and performing more effectively, we continued on our way to Kibo. 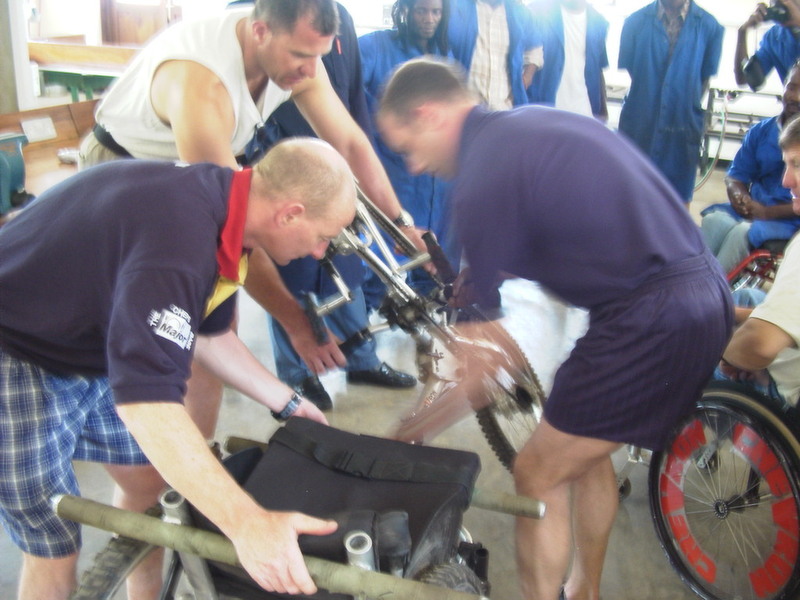 Having fallen over a large rock the previous day, Steve Hargreaves had hurt his back and found that this restricted what manual workload he was able to perform, so he took on more of a scouting and foreman role for the team so as to still be as an effective a member of the team as possible. Given the already reduced team size, with Neil and Simon having gone ahead to scout the summit trail, team changes were now more frequent than the previous days had been to ensure the same few didn't do all of the workload and had adequate rest periods. Jim Mann had also looking just a bit 'off colour', so he was asked to take camera duty for a while, which was to benefit him and the expedition in the longer term, despite his personal feeling that he was somehow letting the team down, but that was the character of the man. However, the team were generally in good spirits overall and as such we made very good progress towards the saddle; the views and the landscape were looking spectacular, especially the majestic Mt Mawenzi which had so many different viewing profiles, dependent upon where you were viewing it from and how the sun lit it up. We tried several times, to no avail, to pick up any signal at all on the mobile telephones that various members had with them, but it was soon apparent that the vast improvements that had been made to the GSM coverage since 1998, when it was zero, definitely didn't reach this far and confirmed our initial thoughts that we had probably already made the last communication we would be able to make, until on the way back down. Due to all of the initial connectivity difficulties, the satellite phone was down to one bar of power left now and we wanted to leave that, just in case it gave us enough for a connection out from the summit. We continued making good time towards Kibo, especially once onto the long drawn out saddle. 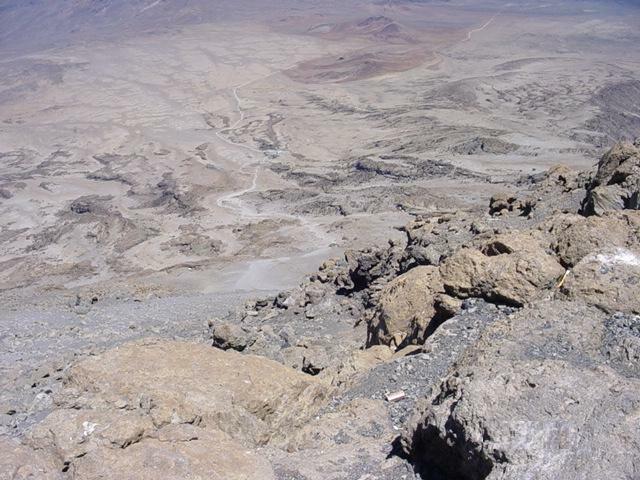 We had started to get glimpses of the trail from Kibo to Gilman's point; with far less snow on than in 1998 my focus was drawn to it's some 60º incline and zigzag trail, which was very thought provoking indeed, especially about the time when we would be on the way back down. We had watched the mannerisms of the many climbers who had made an attempt on the summit that very morning, both successfully and unsuccessfully, and they were now descending and wishing us well in our own efforts to reach the summit. The effects of altitude upon some of them was very noticeable, some looking very distressed and like they were on their very last legs, others just behaving really strangely. The majority were stating that they had not managed to reach the summit, some had reached Gilman's point and just two stating that they had made the Uhuru summit. At this point 'Wolfie' was our first major casualty of altitude, leaving him looking very debilitated indeed. Jon and Jimmy Mann sat amongst the foothills of the saddle. 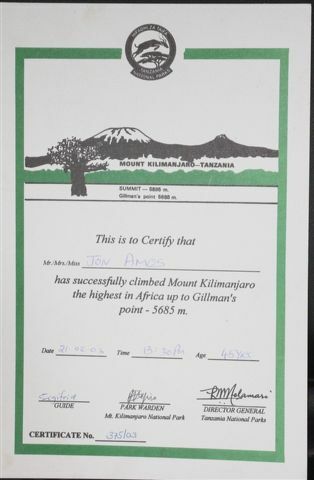 We arrived at the Kibo huts at 12.15 p.m., which was some four hours off of the time taken in 1998 and unlike the previous days where we were just somewhat outside normal trekking pace, this was well inside of the estimated time of five hours as shown on the board at the gate. At the time I thought that this had to be good and bode well for an all out attempt on Uhuru, the ultimate summit, especially as the daily rest time for the team had been more than adequate and they were all looking in pretty good shape generally. Several factors could be taken into account for the reason for the teams good shape at this point, as opposed to the 1998 expedition team, one being that they were all taking diamox, two being that the additional porters that we had, had carried the main backpacks and they supplied us far better food on a more regular basis than the ration packs eaten in 1998, three the route had been vastly improved since 1998 helping contribute to some of the time saving, or four the team were just awesome and in supreme shape. Obviously it was a combination of all factors. Neil and Simon appeared on the scene and it was soon apparent that both appeared to have very different opinions on the trail to the top of the mountain and the best way to proceed - or not. Giving a straight answer to a straight question, after a slight intake of breath that is, Simon's words were that "it's do-able but it's going to be dangerous in places". Neil seemed to have a different opinion that he kept to himself at first and then later held private consultation with each and every one of the support team, giving me some cause for concern as this wasn't the first time that consultation had gone on around me rather than with me. Neil did say that he felt that some areas of the trail definitely raised concerns and might even mean getting out of the chair at times. 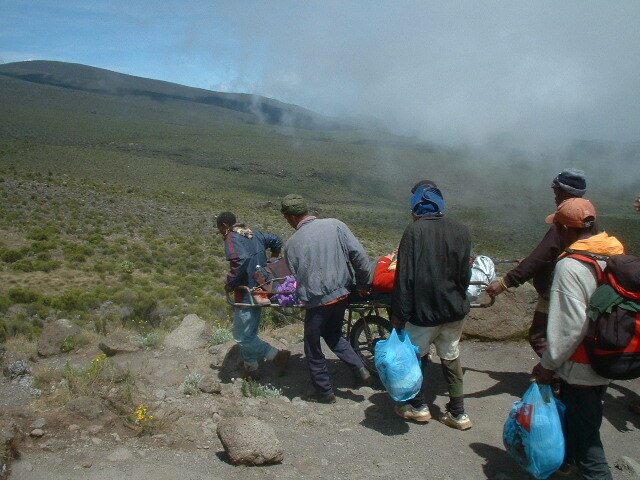 He also stated that his team were going to be totally debilitated and more man power was needed - I asked Sigfrid about the availability of the porters continuing up the top end with us and then got into the usual bartering of how much extra they would get before finally securing what we needed; this was because they would usually stay at Kibo to rest when the usual tourists summit. There had then been a definite mood change happening in certain quarters, but as it had been said all along it that the main priority was to get me to the top and that there would be no point in the team getting to the top without me as that would be meaningless, I thought that maybe the earlier concern was unfounded. Although very original discussions had been about possibly using the two days left to have two goes at the summit, further discussions took place about when and how to attack the top and whether to have additional rest day to allow Neil and Simon to rest after already reaching the summit or just attack the top. It was decided that only one good attempt would now be made. We were to leave at 6.30 a.m to make the most of the daylight hours - it was to be summit or bust !! Day 5 - Final Ascent? Despite a very much expected disturbed nights sleep due to a howling wind and other climbers leaving to attempt the summit section, (and some that were even returning early, presumably having been unsuccessful) at various different times during the night, we had all been awoken at around 5.15am to be given hot water and breakfast; Due to the strange actions and somewhat surreptitious behaviour happening the previous day, for a short while after coming around my mind had drifted back, thinking of how there had been many discussions between Robbie and I over the many months before we actually left for Tanzania, and on very limited occasions after arriving there, about which would be the best plan for attack on the summit and how best to utilise the extra day/s that we had manage to secure this time. 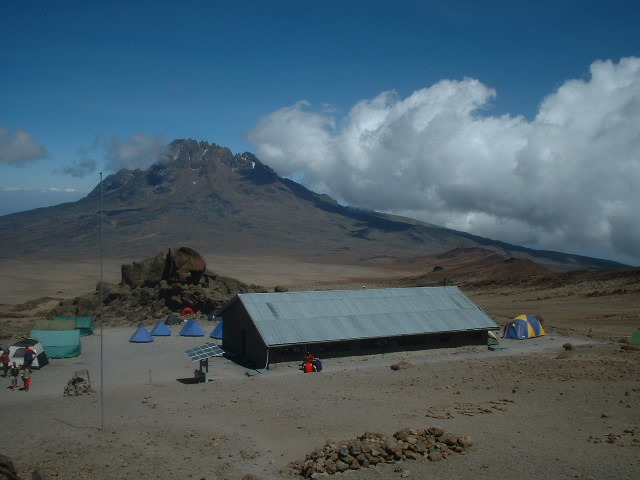 Whilst the various discussions had taken into account the many different potential scenarios that we might encounter, there was always one constant, which was that we would not leave the last hut for a midnight run, as was the case in '98 and the 'norm' for most climbers who would leave at that time in the hope that they could make the summit in time to see the spectacular sunrise that is so often attributed to Mt Kilimanjaro. Instead, even despite more recent discussions around leaving at many various times during the night and others about whether or not to spend another whole day at Kibo to allow Neil, Simon and the support team an extra day to recover, and albeit somewhat a gamble in it's own right, the final decision was that we would leave at 6.30am and have just one ' pop at reaching the top'. This was to give Neil and Simon some extra recovery period, given the fact that they had already previously reached the summit the day before, and would also allow us the relative luxury of seeing the path ahead and then spend whatever given amount of time that would finally be necessary to get to the 'top' and then back down to Kibo - at one point a 20 hour session was spoken of. This in itself had been a difficult decision as it meant that whilst we would have the added benefit of daylight, the usually ice packed ground would be thawed to some degree and inevitably much looser underfoot. Neil had stated that it would be best if I wore a sleeping bag over any clothing for extra protection against the elements of wind and very chilled air, but this idea was finally dumped as it created too much extra restriction of mobility for me and was generally quite aggravating. Another constant that had also come to mind was the often reiterated but somewhat reassuring statement that the solitary objective of the expedition was 'to get me to the top' followed up with another statement of 'what use was it for the Marines to get to the top without me being there as that would be meaningless - as they could always get to the top! We assembled outside the hut at 6.35am, with most of the team in good spirit and looking fairly rested, except Mark who had not been too well after getting out of bed and had decided that a 'diamox' might be necessary, if he was to be in any fit state to continue right to the top. The team of porters were already there and seemingly ready for the task ahead - once we had managed between us to 'gift' them gloves and some other small articles of clothing that they did not have for themselves that is! They roped up for the task ahead and we were on our way. It was not too long before it became very apparent that the porters were certainly not used to working as a team unit. Several times they had to be reminded to all pull together and not ad-hoc as was the case. Despite this and the nightmare terrain, which, as had been initially thought of, was thawed and now very much looser underfoot, the pace was still good and, once again, we were not to be too far behind average trekking pace. 'Wolfie' was once again suffering in silence, so Simon stayed by his side to ensure that he was safe and constantly monitor if he was fit enough to continue. This was absolutely vital but had meant that we were temporarily left two men down for a while. We had reached the marker set in 1998 with relative speed and continued at a similar pace until we were actually sat alongside Hans Meyer cave, where we stopped for a short break to fuel up and make the most of photo and video shoot opportunities. Jimmy decided to film me and ask how I was feeling at this point; In response I stated that I felt reasonably good and continued to say that I believed that everything had been going so well overall that the balance of possibility had to now be totally in our favour for reaching Uhuru, the ultimate summit. Once leaving Hans Meyer cave and taking a sharp left turn, the trail ahead of us was soon seen to be more severe than that it had been up to Hans Meyer cave and even more acute than it had appeared to be from the distance during the previous days trek. The workload to ascend up the near 65º zigzag path was now severely increased and surpassed anything that we had to contend with previously; I had hoped that the extra work necessary on this section had been offset somewhat by the fact that the bottom of the trail had now been vastly improved and had resulted in the first two days being far less arduous than during project '98, in turn allowing for a much quicker ascent and therefore leaving more rest and recovery time for the team. The previous day Steve Hargreaves had obviously given some thought to the difficulties of the next stage of the climb and suggested turning the chair around to allow the rear wheels to become the drive wheels in the hope of easing the workload over the loose rock and screed and enable us to take a more direct and straight route up the mountain. This was tried out for a short while, but whilst working well to some degree it did not give the overall result hoped for in terms of effort efficiency and the chair was turned around again. I was more than happy about this at the time as I had not been too comfortable with it at all , as it threw any limited balance I had right out the window and got my heart rate up a few beats or so on several occasions. On one occasion Jimmy did remind me that I had earlier said that I was willing to try anything to make the climb successful - 15 love - touché to Jimmy I say. There was no doubt that the porters had been working harder now than they were use to and they were once again becoming very uncoordinated in their efforts, meaning that those members of the support team that had been helping out alongside the porters were having to work twice as hard now; at this point there were some of the team who had definitely not been as involved as others had been and therefore had been able to gain some 'rest', to a point, which at the time I felt would be good as we got ever closer to Gilman's point as it would mean that they would be able to take over, or at least come into play for the last stretch to Uhuru. One of the team had been very noticeable by his absence, for the best part of the day, and during the previous day come to think of it, as he had been off taking photo's for himself, so he, at least, would have been in absolute top form for the final section! All of this was soon to become irrelevant as it had became increasingly apparent that there was a lot of discussion being held by Neil with a few selected individual members of the team. I had thought that at any time he would come up the trail to speak to me to raise any concerns that he might have discussed with others (although, even given the increasingly difficult terrain, I could not think of any major concerns myself at that time). Discussion or consultation was not to be the case, Neil finally jumped up onto a boulder metres below Gilman's point and declared the attempt over, including something in his speech about daylight hours and time needed to get back down to Kibo. I saw Robbie's face, it spoke a thousand words, he was obviously devastated, as were some of the others, whilst I was just mesmerised, somewhat shocked, and really couldn't comprehend what I was hearing, as there was the summit seemingly all but in our hands, the weather window was excellent and we had plenty of daylight hours left as it wasn't far past midday so the final ascent from this point could have been as 'Poly Poly' as we wanted it to be. Yes, the terrain was difficult, but that had always been known to be the case for this particular section, but apart from the debilitating altitude, it was certainly much less difficult a terrain than the goat track up Great Gable had been in 1996. There were various choices that could have been made at that point, one included an offer from one of the team to carry me 'fireman's lift style' to the top, in stages, if necessary, and he meant it too! 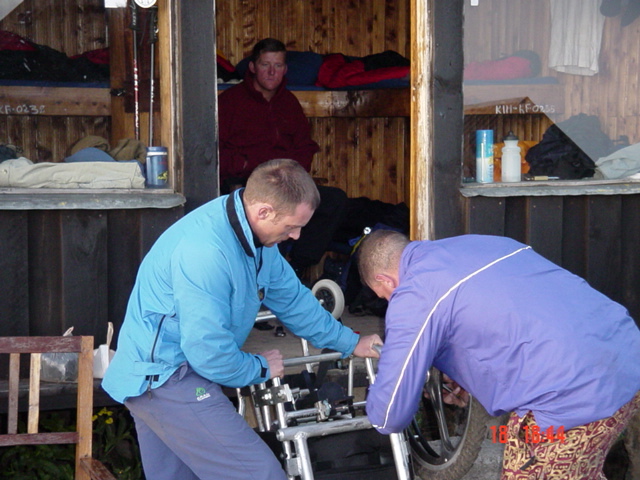 Despite the many emails and people and sponsors quite rightly asking me about this since returning home, this was never an option that I could conscientiously consider as it would have meant defeating the whole object of the initial expedition goals, which were setting the record for the highest altitude gained on a mountain by a wheelchair user - in a wheelchair! and pushing back the boundaries surrounding people with a disability, self created or otherwise, by showing everyone what can be achieved, even if sometimes you have to ask for help. Whilst I was still in the slight state of disbelief, Neil had told the support team to continue and make their way to the top, whilst he and Simon, along with the porters, set to the task of assisting me back down to Kibo. At this point Mark stated that he would leave it and accompany me back down. I insisted that this was an absolute nonsense, given that he had travelled so far and was so near to the summit, and that it would also be useful for my piece of mind if he would finish ascending the rest of the trail in order to feedback to me if there was any relevant reason for not continuing the last couple of hundred metres. 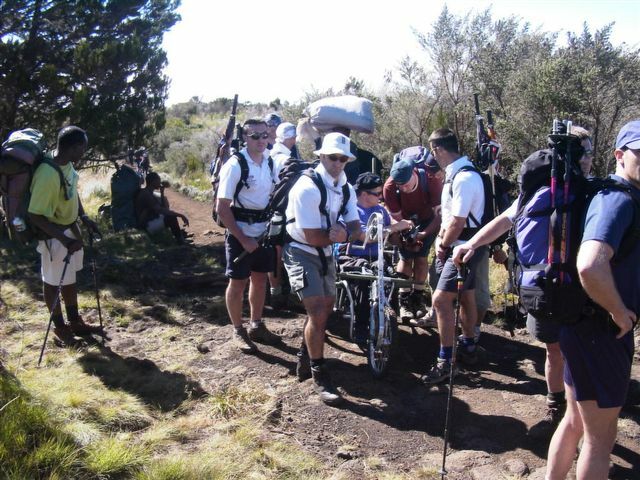 So off he steadily went, with everyone else to make the summit at Uhuru, whilst Neil and the porters roped up to the chair and using Simon, with his knowledge and expertise, as anchorman we started the awesome descent down to Kibo. The view when looking down and across the saddle to Mawenzi from Gilman's Point. Most of the time I literally felt as if I was standing up once again, so steep was the trail. There was no time then for any reflection on what had actually just happened so near the summit, as my concentration was so intense, whilst I was constantly watching for the best lie of the land ahead of me, and my arms were pretty much locked solid for nearly the whole descent until the last hundred metres or so to Kibo, clutching quite firmly on the brake mechanism. The odd glimpses that I did get of the views on the way down were spectacular and what one could describe it as being like looking down on the earth from a hot air balloon - or the earth from outer space given the textures and colours of the volcanic ash saddle from Mawenzi to Kibo. 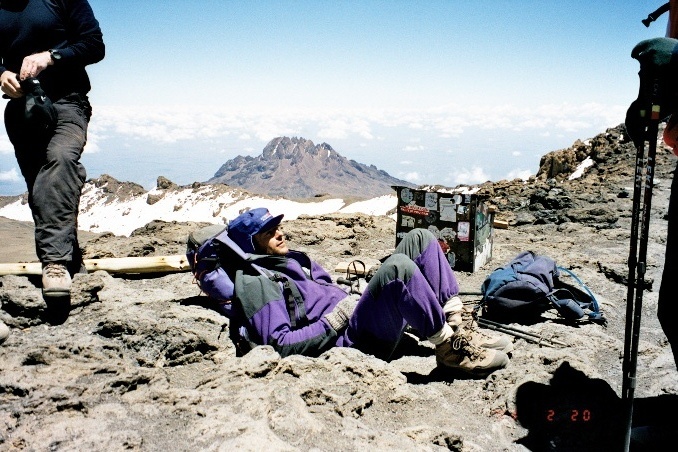 We reached Kibo hut at 2.15pm, which, as you will see from the picture below, is nearly the same time as Mark was photographed resting at Uhuru summit; it was a tribute to Neil and Simon's skills that we were to make such good time down, but unfortunately it had not been without some personal repercussion to me. I was more than happy to be greeted with hot water a short while later to wash off the accumulated dust and grime but then began to once again reflect on what had really been going on at the top - we had made it down and still there was still some four + hours of daylight left! It didn't seem too long afterwards when Simon came in the hut to tell me that the lads were on the way back down the screed section - it was well less than two hours after we had arrived down ourselves. To Simon, I must have appeared disinterested but I was still reflecting on the whole event, including a discussion held with Sigfrid on his view of us needing to stop when we did, which had differed entirely to someone else's view - At the time I was actually more than happy that the team had been successful, but I was also eagerly waiting to see what Mark would say about the remainder of the trail and was now also thinking of the timescale for getting off of the mountain and carrying out the project work and visiting that was still to be done with the schools, orphanage and wheelchair project. However, that is now history and never to ponder on what might have been, none of this should under value the outstanding core team work that had indeed happened and new friendships that had been formed, and the fact that an astounding new altitude record has yet again been set for other wheelchair users to now challenge!!........ My Sincere Good luck and best wishes to all others that try to push boundaries further forward! Once again, there had been some conversation, rather then communication, this time about the descent and, given the circumstances, the general consensus was to leave the mountain in one day, although there was very much a common goal insomuch as most of the lads wanted to get down in time to watch the England Rugby team play their latest match in the six nations cup that was on the television that evening. We started out at around 8am in a bitterly cold wind. There was an almost immediate apparent divide in the team, 'the doers and the talkers', as Neil had often commented himself. This was not too much of a problem for the long downhill section back across the volcanic ash saddle but became more noticeable throughout the rest of the descent. The problem, it was said, was that several of the team were left debilitated from the previous day's work. The truth of the matter was that most, if not all were tired, yet some still managed to find the extra needed to 'dig in' at times. The weather became very hot and necessitated the need for taking on water much more regularly. The descent was taking place at an extremely rapid pace and resulted in some very hard breaking and swift steering control at times. Even so, and despite the excellent manoeuvring and control, I fell out of the chair four times, each and every time to the right hand side, which finally pulled once too often on the right shoulder girdle and created some discomfort over the weeks to follow. On one occasion Mark had been in control at the back of the chair whilst I hit a boulder causing the chair to go into freefall. Mark managed to put his bodyweight behind it, helping the chair to start correcting itself, at the personal cost of him disappearing over the edge of the trail and into the prickly vegetation for ten foot or so, soon to be followed by me crashing, once again, to the floor - it did create some smiles from those around me though! The speed of the descent was almost too quick at times. One of those occasions was when Rik and Jimmy had gone on in front to take some downhill photographs and they were stopped by a group of people showing an interest in the event. They were from the West Country, Great Britain, and were doing a charity climb for SCOPE. It came to light that they had seen and heard about our event through the various media, radio and television network coverage that we had gained in the UK. Unfortunately my 'approach' was a bit too fast at the point they had stopped and, despite having the brakes fully on, I skidded past them to a rapturous applause and calls of 'well done Jon' - quite emotive moments. 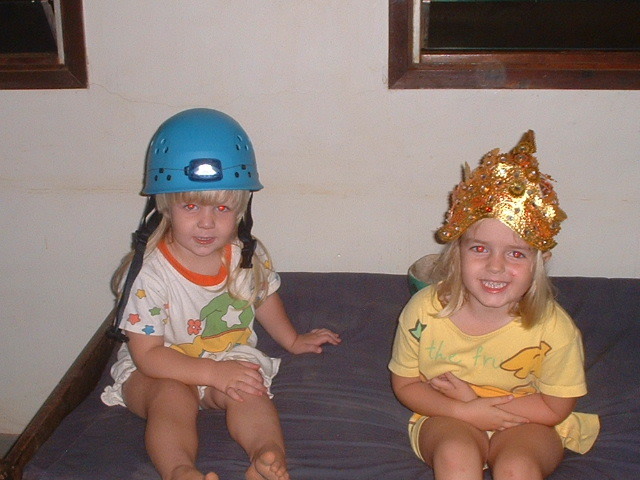 Both my apologies for not stopping, and my sincere thanks for their rapturous support goes out to them. More and more during the descent we were to be greeted and congratulated by other ascending climbers and their porters alike - the record breaking news had obviously spread. 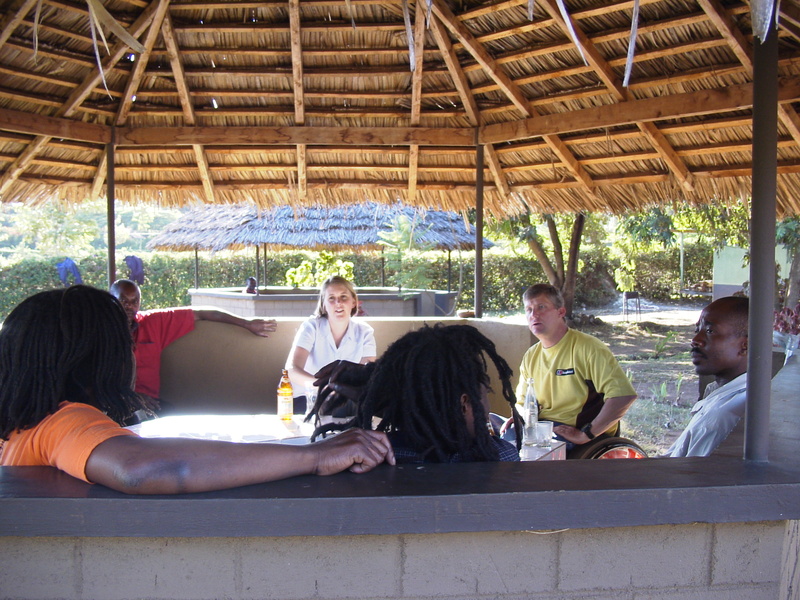 We made the Horombo camp in very good time and it very much looked like getting off of the mountain and back to Moshi in time for the lad's to see the Rugby and have a few beers was definitely on schedule. 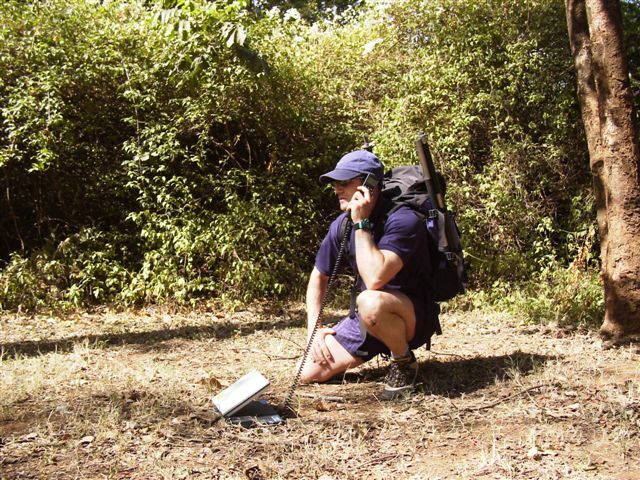 Reaching Horombo was also a good time for most to get a bit of 'relief' and for others, myself included, to try to pick up telecommunication signals in order to get either text or verbal messages home. Jimmy, as usual, picked up a strong signal almost immediately, whilst I struggled to get one bar - he had obviously paid for a better service!! However, the one bar signal that I had gained gave me just enough to get a text message home to my wife and children to let them know that all was going well at that point in time. It was also good to take a few minutes respite for my arms and to take in the breathtaking views across to the Serengeti plains and Ngorongoro basin. Sigfrid had wanted to arrange lunch for us at Horombo camp but, given the speed of the descent, we requested that he leave it until we reached the Mandara camp. The stage down to Mandara, despite being a much more difficult terrain, was still covered at a fairly rapid pace. With the descent continuing to be so quick, a rapid take up of oxygenated air was inevitable. This created its own problems with a couple of members of the team. Wolfie, for one, was still suffering but now looking even more the worse for wear. Jimmy had started to have a stomach disorder and I had started to get a terrific headache but I put it down to the speedy descent. This was on top of the ailments that other members of the team had already purported themselves has having throughout the day. It had seemed to take forever, but we arrived at Mandara at 2pm and a lunch was now very much the order of the day. Most were looking for fresh water and other soft drinks at this point. Wolfie was now looking very poorly and showing the symptoms similar to that of severe dehydration. I just happened to have had some powerade electrolyte mix with me for personal emergency use and gave to Wolfie immediately to stir into his own drink after which Rik took him outside to pour some water over his head to help cool him down - the recovery effect seemed to be almost immediate. The headache that I had acquired earlier had now resulted in one almighty nosebleed, which seemingly took forever to get under control. Mark took my cap and doused it in water and donned it upon my head - very cool - literally! Given the amount of adverse affects on various members of the team, a 'deal' had been struck with Sigfrid. For yet another extra charge, he would allow us to be escorted down the porters / emergency escape route. This was excellent, as the route had recently had a lot of upgrading work done on it, apparently by a volunteer group from Finland, in order to allow Landrovers to gain better access and get closer to Mandara in order to assist porters with any climbers they might have had with medical emergencies. For me it meant that I could crack on at a nice steady pace, pretty much unaided from thereon in, except for the occasional 'steadying assistance' given by Rik, Jimmy, Mark and Rich as I crossed rocky or very uneven ground. Making the Mawenzi viewpoint, at the bottom of the trail, in very good time, I decided that it would be best to sit there and wait for the remaining team members to catch up, so that we could all arrive at the gate at the same time and allow for Sigfrid to take some good final footage of us arriving back at base. The first idea was good the second not so, as the footage he took with my JVC was of everything, the woods, trees, trail floor, his own legs, but none of the teams final glory! Now the actual climb was finally over, Rik, Wolfie and Jimmy went to see if they could secure a bargain from the mountain supplies store by the gate. It appeared that most climbers , especially those known as 'once only' climbers donated some, if not all, of their clothes to the guides and porters as a gift of gratitude; they in return would sell them to the shop for preferred cash and then the shops would sell them back onto other climbers meaning bargains, such as $200 jackets for $40, could be had if you were there at the right time. I never did find out if Neil and Simon had tried to return the umbrellas they purchased at the start, as unused items!! 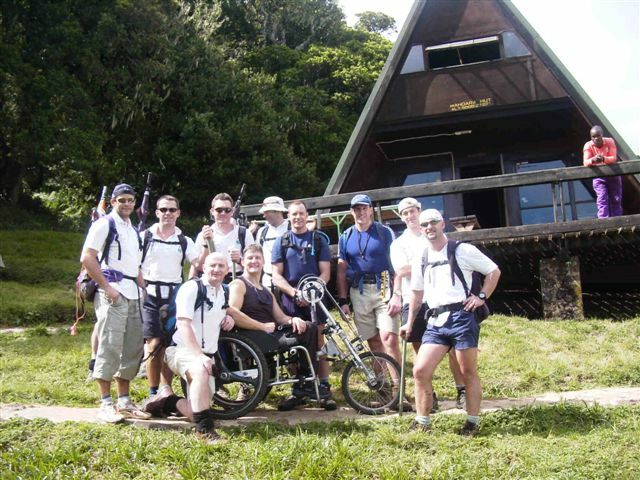 Whilst some of the team returned to load the bus with our equipment, Robbie, Rik, Jimmy, Wolfie and I stayed at the gate with Sigfrid to have a cool refreshing fanta, sign off of the mountain and collect our certificates of achievement - the lads for commendably reaching Ulhuru and me for setting a new world altitude record for a person in a wheelchair. All in all, one could say, an overall success!! when Jon and the team were finally signed off of the Mountain. Whilst many could be forgiven for thinking that this was the end of the project, today, despite an horrific stomach disorder, and despite the fact that we should have still been on the mountain at this point, I was not resting but starting the clean up of my dust laden kit and finalising details with another Mark, our local contact and driver from TATCOT - the Motivation project, to arrange times of my visits to their wheelchair project at the KCMC, which sits in the foothills of Mt. Kilimanjaro, followed by doing some final bartering with him and his 'friend' for a good deal for the majority of the team who were going to go off on Safari for a few days, all except Wolfie that is, who was studying for an up and coming exam and Mark and myself who would carry on with the various elements of project work and upholding my promise of presenting various awareness discussion workshops with some of the students at the International school of Moshi. The best part of the day was spent cleaning and packing away kit and talking to local media. The evening was spent uploading photos taken during the earlier days and making an appreciated satellite telephone link with home. Day 8 - 24/02/03 - Visit to the TATCOT centre. Our newly inherited neighbour, Gill Williams, had came to the rescue once again and offered us the use of her clothes washing facilities - obviously the woman had gone crazy in the heat as everyone was up for that! 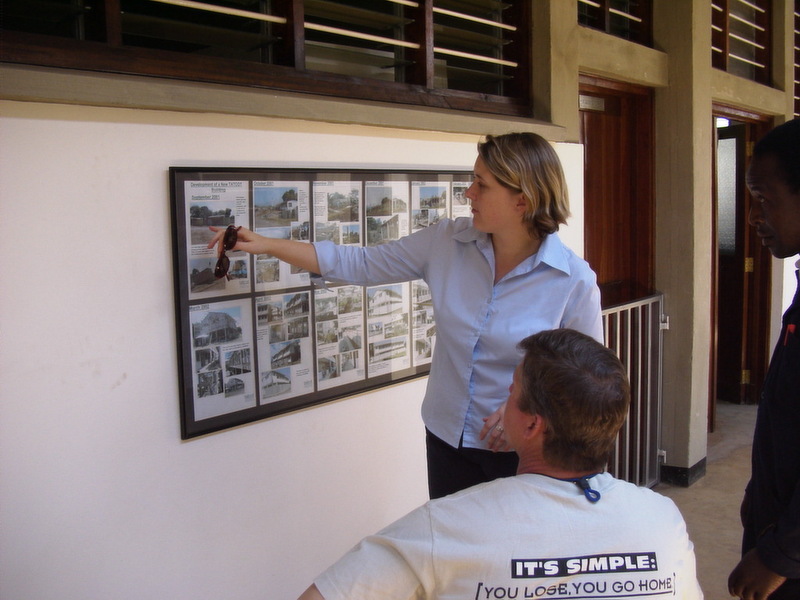 thanks to Gill once again - a better host one could not find, especially in Moshi! 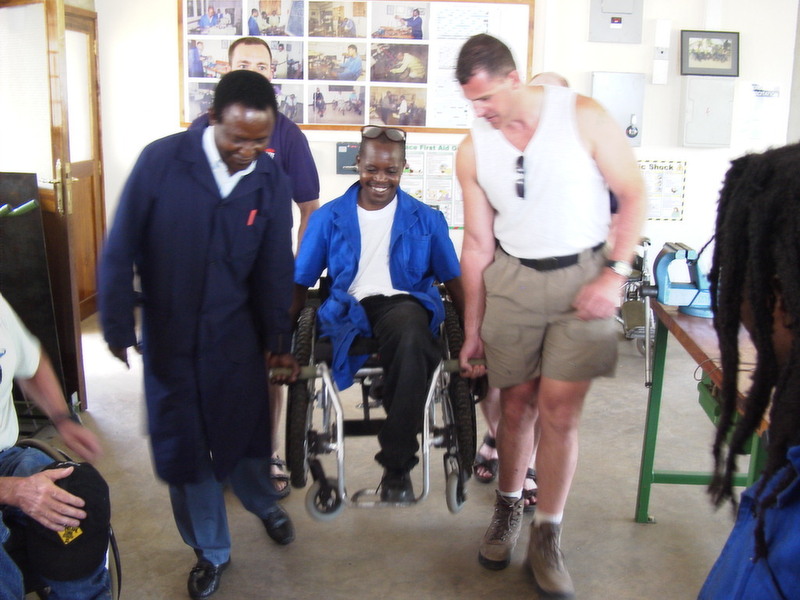 This worked out very well though as it allowed for me to have additional time to visit TATCOT ( The Tanzanian Training Centre for Orthopaedic Technology) accompanied by Mark and Jimmy, Rik, and Wolfie who had asked if they could come along. 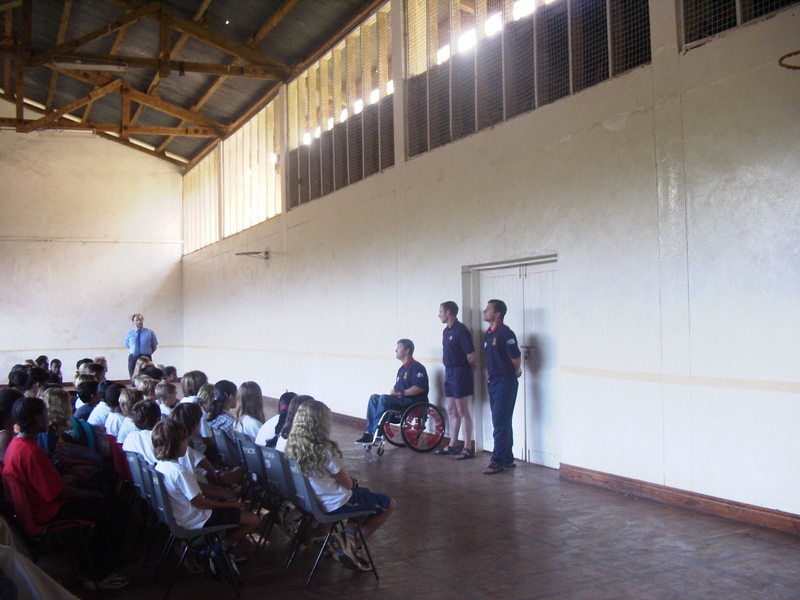 The students had requested that we bring along the 'mountain' chair to compare with the wheelchairs that they had designed and built for local people so that they could use them in and around their own local terrain. 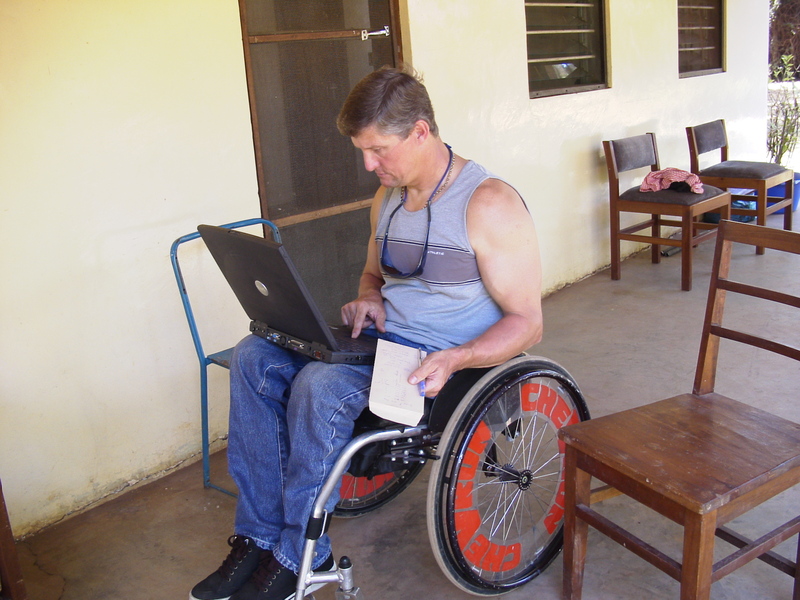 There was just a two man team actually working in the production unit at the centre when we were there and they turn out one wheelchair every 3-4 weeks, with the most basic materials, tools and machines. 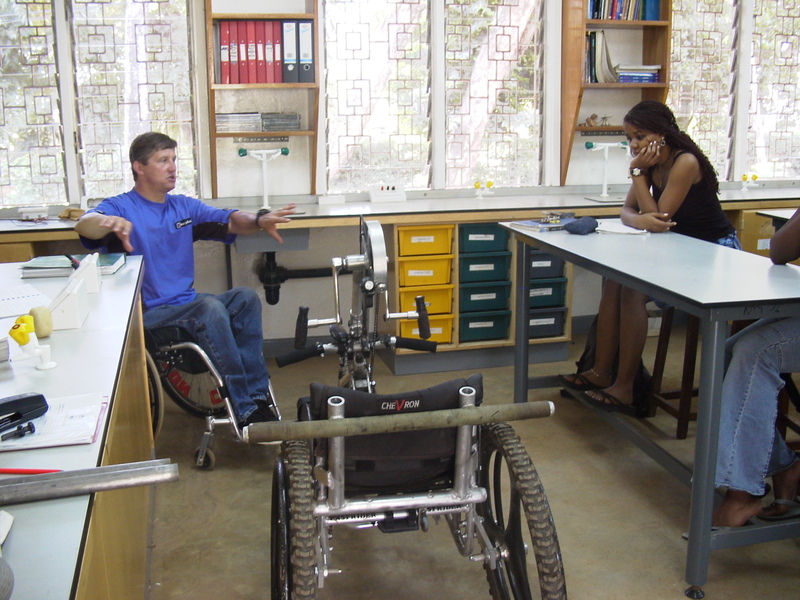 The centre is quite unique insomuch as it puts students through a certificated course of wheelchair design and technology, helping them utilise locally available, and sustainable, resources and materials to build local people wheelchairs to suit their personal environments. The students will then take their new found expertise back into their own localities to widen the field of availability to many more people - excellent venture! 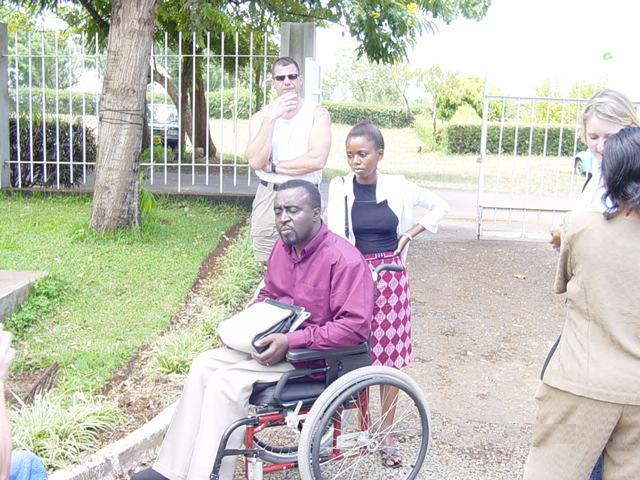 Whilst at the KCMC hospital, I also met with Joshua, a Paraplegic of some twenty years, and he admitted that it was still very hard, even despite the years, trying to come to terms with his disability, but went on to say that he had recently married and now had a new born son and had decided that he had, in his words, better try harder now for fear of losing his beautiful young wife. He went on to tell me that the second part of my planned visit that day was going to be in vain, as I had been hoping to call into the hospital to meet with Alec, whom I had met in 1998; he told me that Alec had passed away just under two years previously. 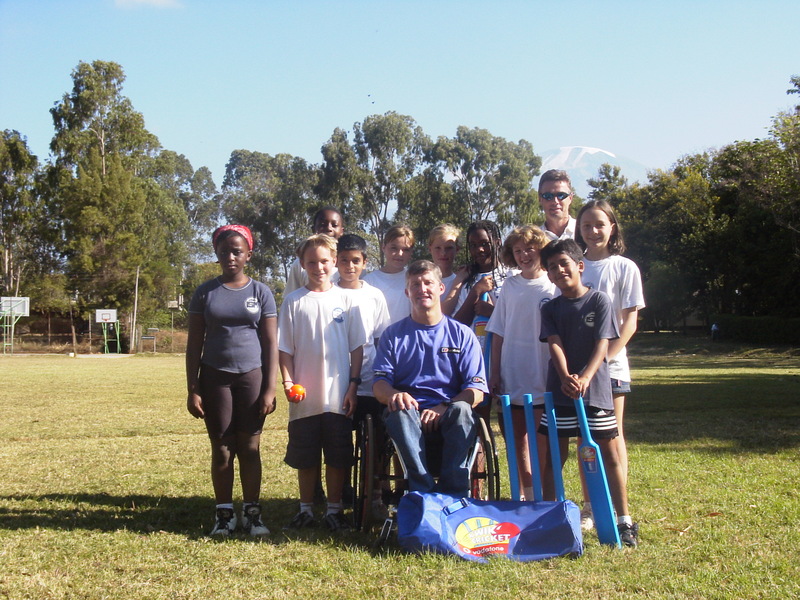 Some solace was found in the fact that he felt that my initial visit in 1998 had inspired Alec to become involved with a local group of disabled people and set up a local spinal injuries association. Rik had been taken very poorly during the day and decided to sit in some shade he had found, whilst the rest of us took the opportunity to eat at an eating establishment just outside the hospital grounds. 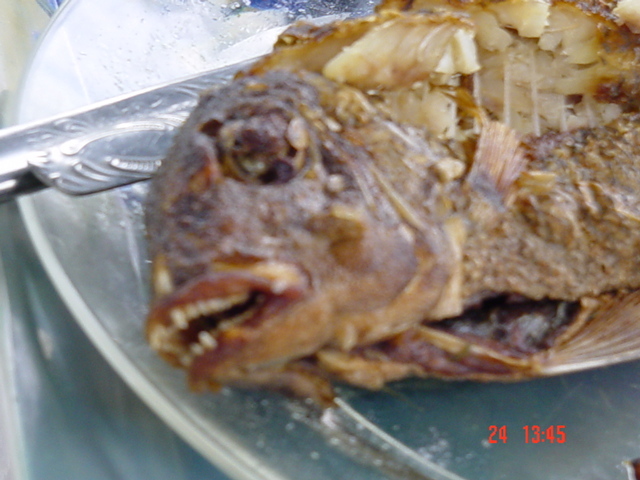 Fish and chips was on the menu and sounded pretty good to me- but was not as expected! With Rik looking worse for wear, we all decided to call it a day and take taxis back to the school. On our way back, Mark and I decided to call at the gates of the orphanage to make sure that it was okay for a visit the following day. Mark (from TATCOT) arrived early today to deliver a letter from the students there. They had made a request for the project chair to be left with them after the previous visit and, having had time to 'play' with it and scrutinise it, they had many more questions that they had wanted to put to me about it's design. The letter was a request for another visit with them, but this time after study time and off campus, at the doctors club. 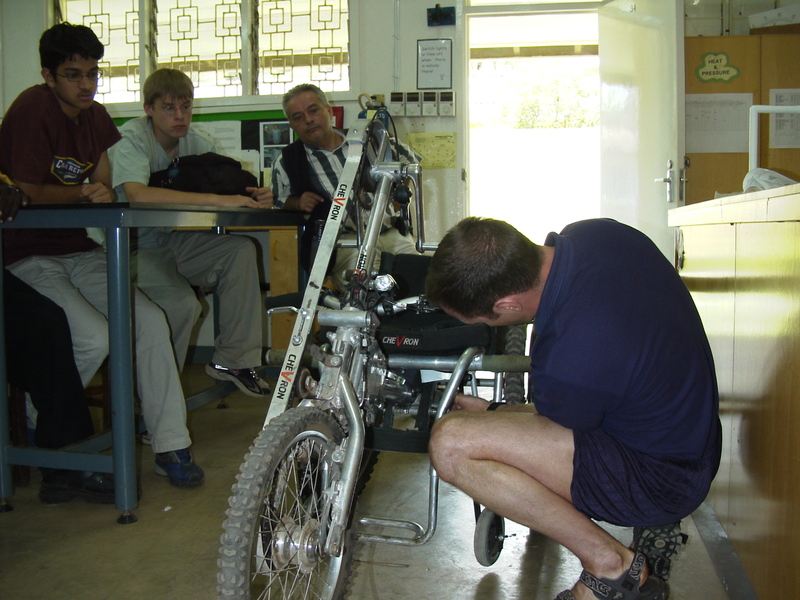 Despite heavy schedules that day, with admin and visiting the orphanage later in the day, it wasn't a request that could be turned down lightly, so arrangements were quickly made for a late afternoon visit, with Gill's help; Reg had gone to Nairobi and his vehicle was loaned to us for the revisit to the centre, whilst the rest of the team went to Arusha to do some shopping. The discussion with the students had gone on a bit longer than anticipated and meant we had to rush to get the vehicle back to Gill and get ready to go to straight to the orphanage. 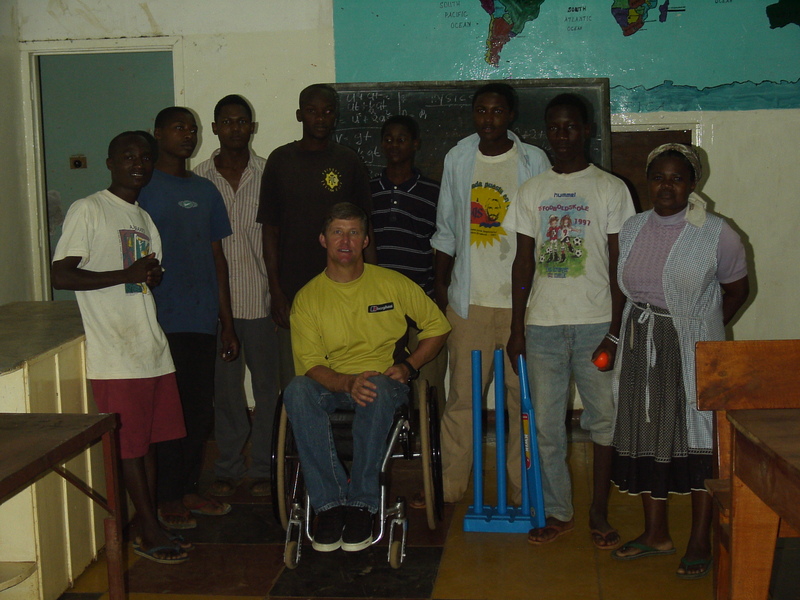 We had decided to walk to the orphanage as it was just outside the school campus and only some half a mile or so - in the pitch black.Mark carried the 'Kwik cricket' sets as supplied by the EWCB (English and Wales Cricket Board) and I carried the books, pens, crayons and other school related resources we had secured for them; I also donned the streamlight head-torch to see where we were going! The visit was quite an emotive one - as they do, things had changed, some for the better and some, in my opinion, for the worse. Since the original visit, any residents were now accommodated at local schools, with a 'top up' being given at the home, which was obviously a good move forward yet, unlike the original visit, there seemed to be an air of despair around the place, as opposed to one of joy and happiness found there in 1998. The boys, seemingly, thoroughly enjoyed the time that Mark and I spent with them, especially when receiving the 'gifts' that we had shared out. Time was getting late, so we left to make our way back in the darkness, amongst the howls of the dogs left to roam wild around the perimeter fence of the school campus and, having chose to use my everyday wheelchair, I picked up a puncture - which is not good when you have half a mile or so of rough terrain to cross! We arrived back at the digs, to find Neil and Robbie sat on the veranda, drinking our beer! 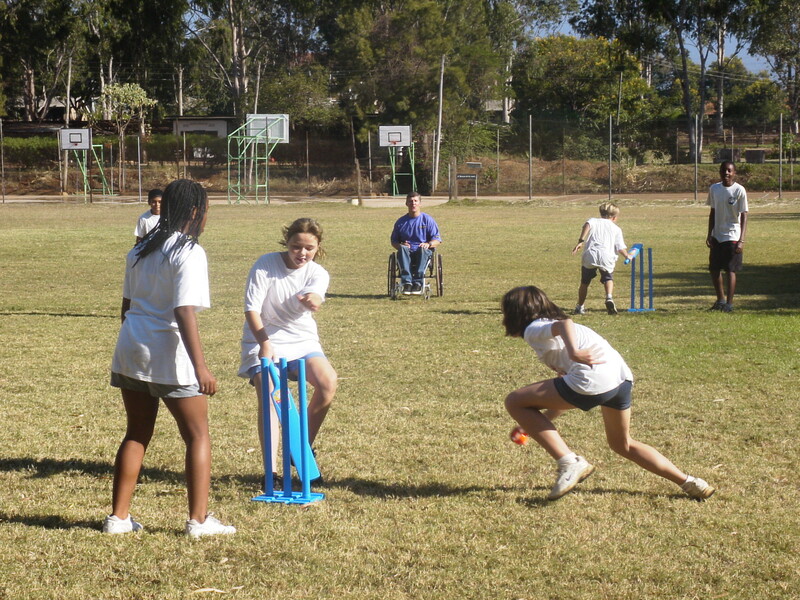 Just not cricket as the EWCB might say!! 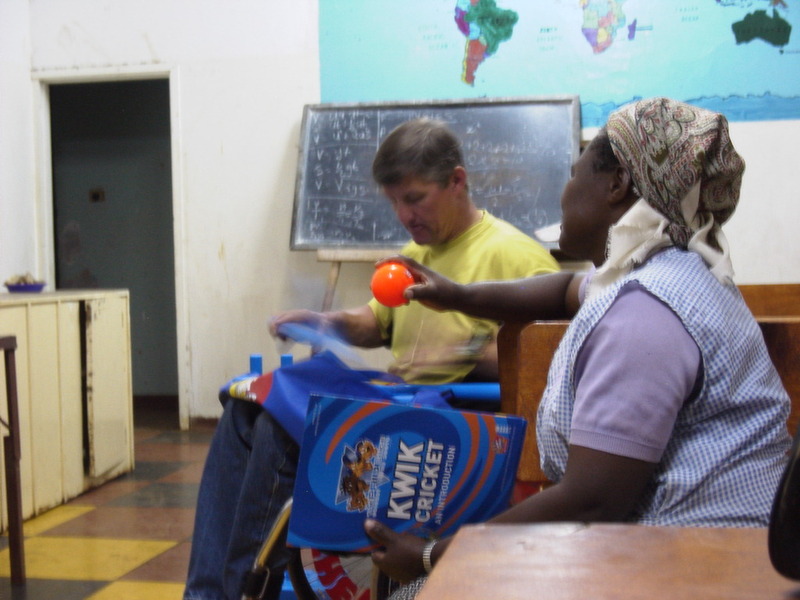 For the final remaining days of our stay, whilst the team went on a three day Safari, Wolfie spent the time studying, whilst Mark Harling and I finished off cleaning kit, preparing and packing the equipment for home. 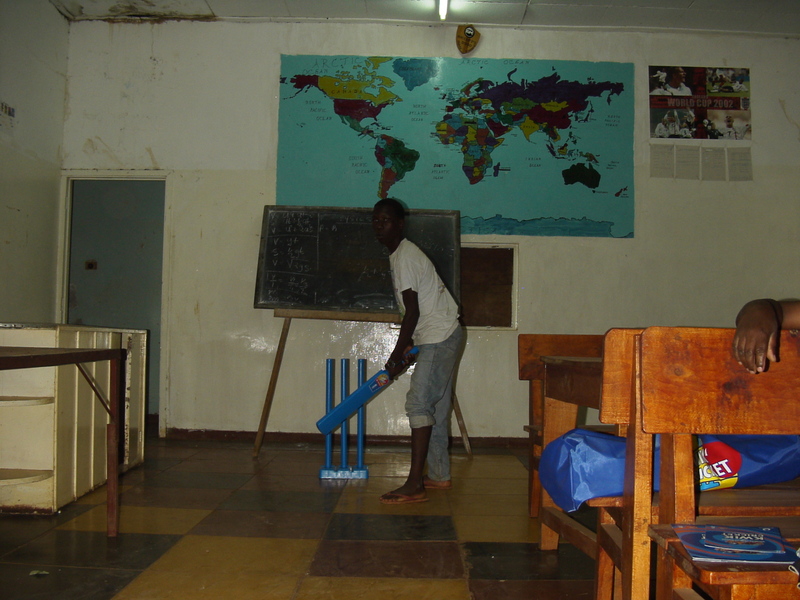 We gave some talks to the older students at the school, took some younger students for cricket lessons, with more Kwik Cricket sets donated by the EWCB. 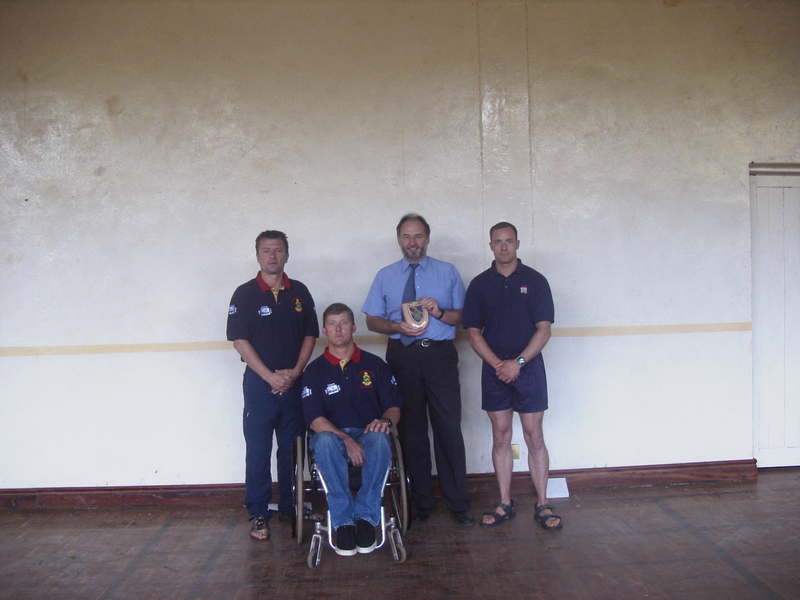 I also gave a talk at the school assembly, where Robbie also presented them with a Royal Marines plaque for their truly wonderful hospitality and, of course, emails had to be answered that had come in from family, friends, all the generous sponsors and worldwide supporters / followers of the event. Then it was time to go home and start the next leg of media, PR and presentation work that needed to be followed up - but that is another story!!! 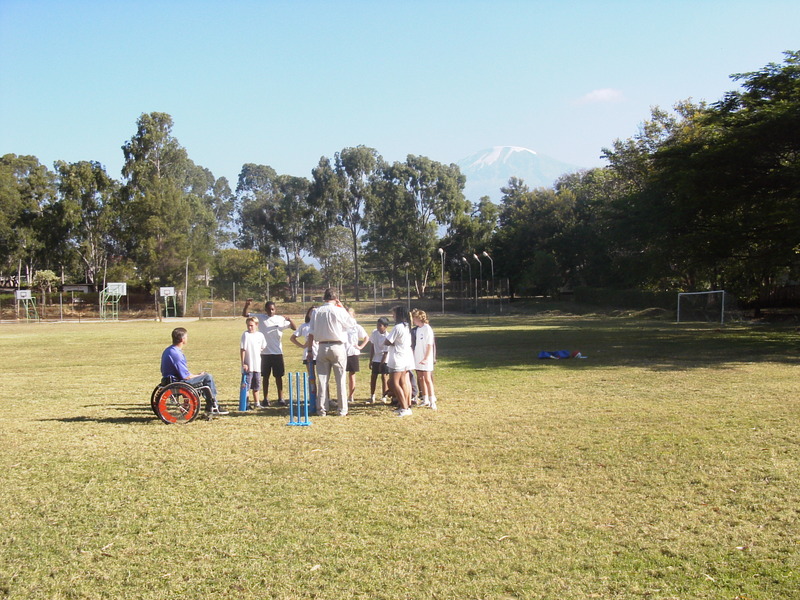 Jon coaching Kwik Cricket to the students at the International School of MOSHI - Budding stars of the future!! 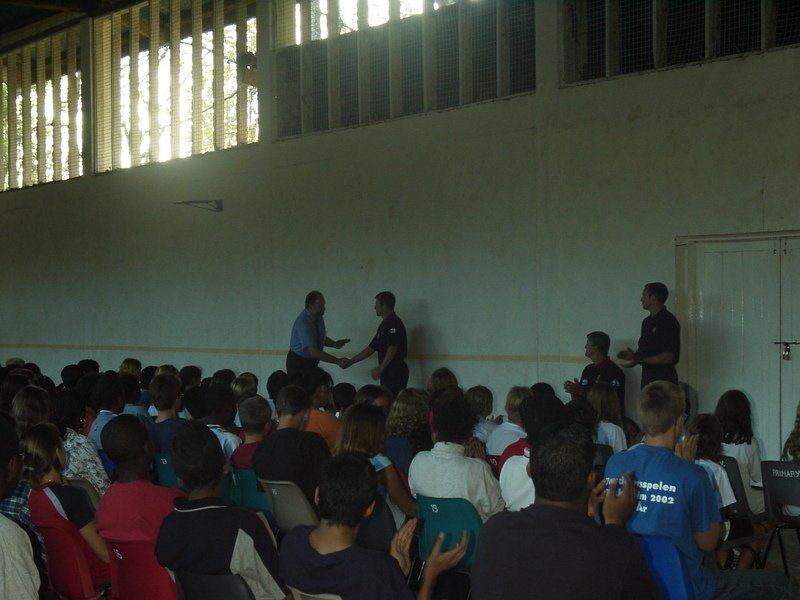 Jon gives a talk at the school assembly followed by a question and answer session and Robbie presents a Royal Marine plaque to Andrew Scott, the Head of the International school of MOSHI.